This month is full of parties, hosting, and holiday activities! I read one of the best articles, by Lindsay Listanski (full article here) on small Thanksgiving hacks that I wanted to share with you. I narrowed down her suggestions to 6 of my favorites; hope you enjoy! After all, the holidays should be about spending time with family and friends, as opposed to hoovered over the stove. Just because you are gracious enough to host Thanksgiving at your home doesn’t mean you need to take on the entire menu yourself. Delegate drinks, apps, sides and desserts to family and friends to cut down on work and on the cost of all the food and drinks. Your guests will be happy to help and proud to show off their culinary skills. If you’re hosting a large party, The Washington Post says go for two smaller birds instead of one. 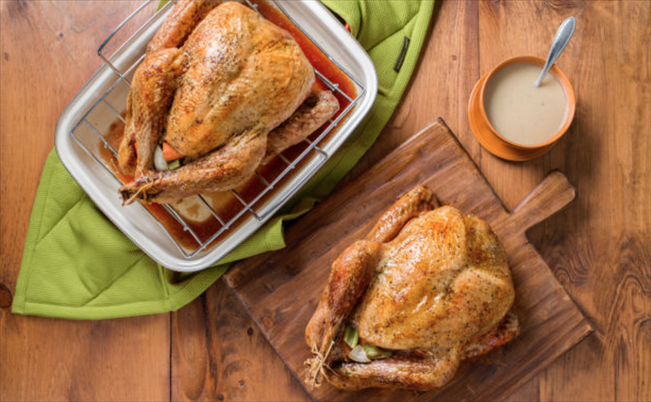 Two small turkeys will take about the same time to roast as one large turkey and you can have two different flavors. You can even roast two in one pan with this recipe from Rachael Ray. Pass the stuffing could very well be the most popular phrase at the table on Thanksgiving. With this Stuffin Muffin trick passing the stuffing is easy and no one needs to fight for the crispy pieces. Check out this recipe from Serious Eats. Have a massive amount of corn on the cob to cook? Instead of breaking out all of your pots consider cooking them in a cooler. This hack from YouTube user Donald Boling is pure genius. Pour boiling hot water, butter, salt and the corn into a clean cooler, close the lid and let it sit for 30 minutes. Voila, cooked corn! Nicked fingers and a ton of time is something any Thanksgiving hostess can relate to when it comes to potato prep. If you boil them whole then shock them in iced water the skin will slide right off! See the whole video from Chowhound. But most importantly, don't forget to have fun! To read more of Lindsay's tips, view the full article here. If you are interested in speaking with a realtor, I would love learn more about your home and situation to see if I can help with the buying or selling process. Call me at 203-994-2731 or kathy.suhoza@cbmoves.com.